A sea fort built two centuries ago to keep out the French navy is under siege from creditors, prompting a businessman to barricade himself inside. 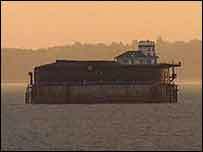 Harmesh Pooni claims he still owns the No Man's Land fort in the Solent. The property developer bought the luxury hotel in 2004, but the discovery of legionella bacterium meant it closed and he was made bankrupt. 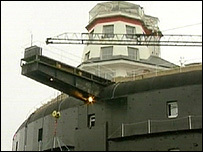 Mr Pooni has vowed to stay on the fort, off Portsmouth, but its administrator has said he is trespassing. The Birmingham property developer told the BBC he has moved into the lighthouse and is refusing to allow anyone to land on the fort either by boat or helicopter. "I have a young family and being away from them is heart breaking but it's something I feel I have to do. "How long can I stay here for? As long as it takes." No Man's Land Fort, near Portsmouth, was built in the 1860s to fight off an invasion by France. In October 1971, its exterior featured in an episode of Doctor Who called The Sea Devils with actor Jon Pertwee. For a brief period Mr Pooni let the fort out to corporate clients for special events at a cost of £25,000 a day. But administrators KPMG have now put the fort up for sale priced at £4m. In a statement, a KPMG spokeswoman, said: "Mr Pooni has never been the freeholder of No Man's Land Fort but was a director of Bob's Leisure Limited a company, which was the registered freeholder of the fort, having purchased it using monies borrowed from Lexi Holdings Plc. "Bob's Leisure Limited went into administration on 26 October 2004 and Mr Pooni was made bankrupt on 23 January 2006. "Lexi Holdings Plc were left as a creditor of Bob's Leisure Limited as the loan had not been repaid. "It is our view that Mr Pooni is trespassing on the fort." Mr Pooni said he came out of bankruptcy in November 2006 and Bob's Leisure Limited was "reconstituted" in December 2007. The battle is now set to move from the high seas to the High Court as it is the subject of possession proceedings, which were transferred there on 5 March.